Synopsis: The top-creators from across the field of writing and an imaiton join forces with revered animation filmmakers on six spellbinding chapters chronicling Batman's transition from novice crimefighter to The Dark Knight. These six revolutionary stories are backed by the superb score of Robert J. Kral, Kevin Manthei, and Christopher Drake, all bringing their unique style to the highly-anticipated motion picture. 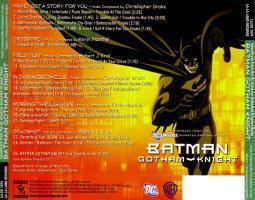 From the start the Gotham Knight soundtrack doesn�t sound like the other DC Universe features. The scope is much more grand and epic, with cues taken from the Christopher Nolan films subtly worked and woven into the mix of the soundtrack. Just before you start to get comfortable with the mix, however, it moves into a pop-rock sounding area that completely changes ones attitude about the music they�re hearing. With six different stories to be told, the variety in the mix has only just begun. From composers Christopher Drake (Hellboy Animated), Robert J. Kral (Superman: Doomsday) and Kevin Manthei (Justice League: The New Frontier), comes Batman: Gotham Knight, a series of stories depicting The Dark Knight in ways we�ve never seen him before. With a mixture of music from Batman�s past and some from his future, Batman: Gotham Knight has the widest array of themes for The Caped Crusader, each of one fitting the different presentation perfectly. 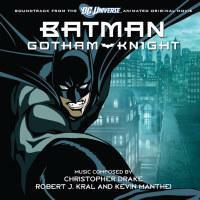 Upon first listen, I wasn�t very impressed with the Batman: Gotham Knight soundtrack. The more I review soundtracks the more I realize that it�s hard to be truly impressed or drawn in by a films soundtrack a lot of the time. Unless you know what to expect, it�s hard to gauge what your reaction will be. 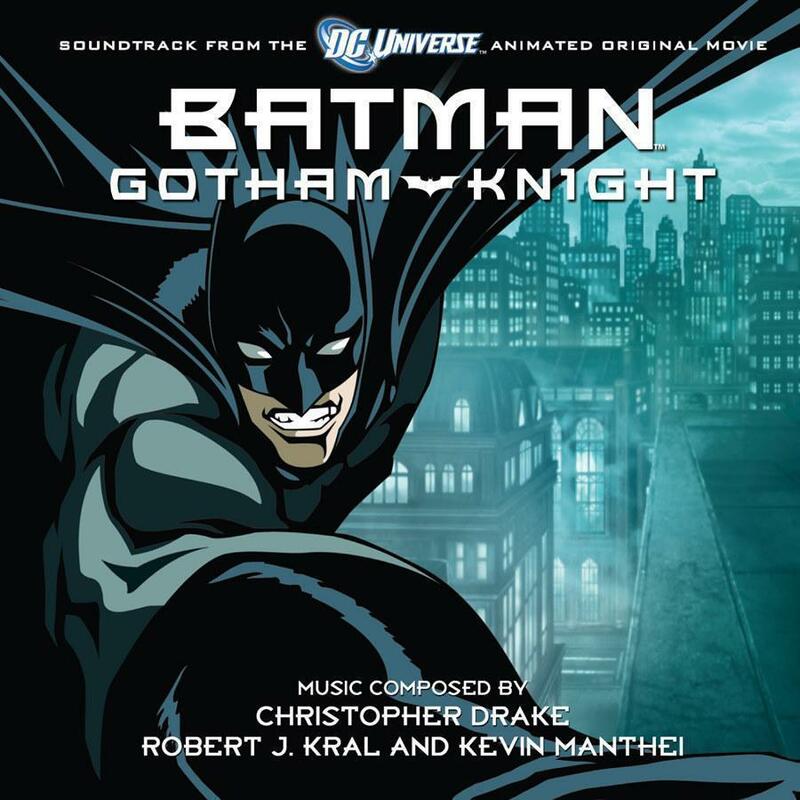 In this case, the majority of Batman: Gotham Knight is a selection of moody and action packed musical pieces that kind of run together at first, with the only exception being the first �Have I Got a Story For You� segment, composed by Christopher Drake. Drake brings in so many different elements to the score for each of the different stories told about Batman and it honestly and truly is one of my favorite pieces on the soundtrack (comprised of the first six tracks on the disc). Oddly enough it�s my least favorite segment of the film, but the music is nothing short of fantastic. The next segment, �Crossfire� by Kevin Manthei follows the vein of Spawn:TAS more than I had realized before. The whole �Crossfire� segment looks like it was pulled from the same universe as the animated Spawn and the music that goes with it also seems to have been inspired by it. I don�t know if that�s true or not or if that type of animation just inspires the moodier style of tracks. In any case, the two tracks that comprise the �Crossfire� segment are very well done, with a nice array of sound effects worked into the score, creating for a haunting experience throughout. 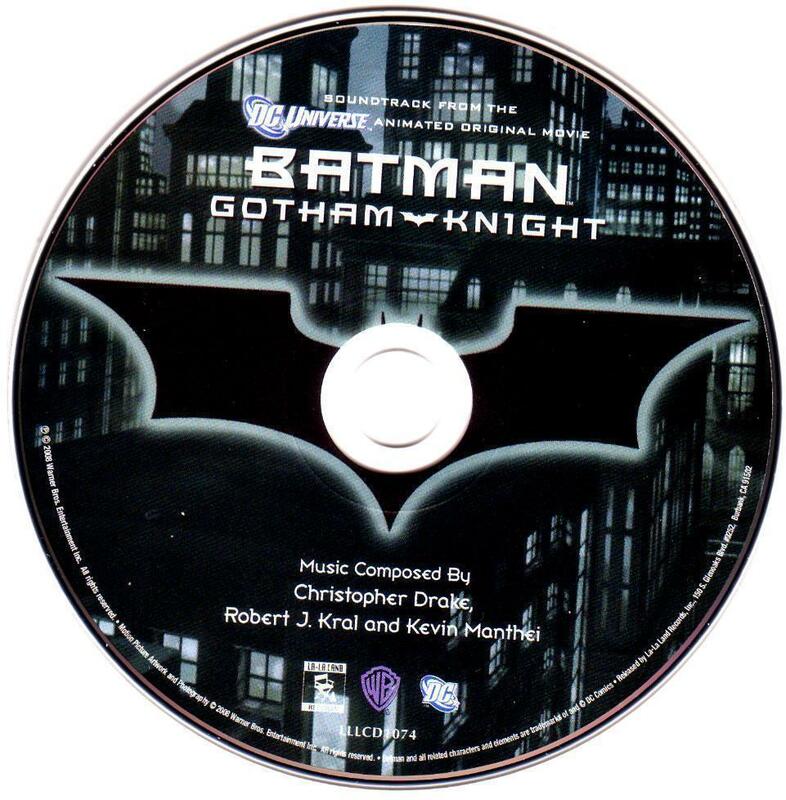 The second track of the �Crossfire� segment, titled �Inferno�, is similar in nature and reminds me of something that would be on The Dark Knight soundtrack. The track eventually picks up from its quiet beginning and rampages full on into the action piece of the segment and blending it with a few �heroic� sounding cues in with it as well. Moving onto �Field Test�, scored by Robert J. Kral, we have another demure score that starts out slow and slowly ramps itself up into action piece. A lot of Batman: Gotham Knight isn�t purely made up of action and it really delves into the characters motivations more than previous animated efforts have. It�s much more serious in tone than other animated expeditions and because of that the score can sometimes sound the same, even when it�s a mix of composers like Batman: Gotham Knight has. In many ways I sense an undercurrent of Shirley Walker�s work on the animated Batman series here, especially her time spent on Mask of the Phantasm. It�s hard to tell just where the inspiration comes from for some of the composers and I may just be hearing other pieces of music that I�m familiar with, but in any case, the �Field Test� segment is a strong example of what makes this soundtrack worth listening to. Moving straight in �In Darkness Dwells�, Christopher Drake returns with a moodier score compared to his �Have I Got a Story For You� piece. It�s also much more upbeat and sounds a lot like a pure �superhero� piece. The �Intro� track sounds like an amalgam of something from Batman Begins and Justice League Unlimited at times. It�s a truly fantastic mix that is carried on through the rest of his work on the �In Darkness Dwells� segment. I will say that some of the score here, particularly in track fifteen (�Killer Croc / Hallucinations / Scarecrow Interrupted�), it has moments that sound like something from the Batman Forever / Batman & Robin score. And no, that�s not a bad thing, as while it may sound similar, it has a much more demonic take on it with the Scarecrow element thrown in, as well as Killer Croc (however brief his appearance may have been). �Working Through Pain� marks the return of Manthei to the soundtrack and includes a bit of oriental flavor mixed into it. Once track eighteen (�Bazaar�) kicks in, it�s almost a jarring change the Asian themes kick in immediately. It continues on throughout the soundtrack, before it finally ends up back with Batman in the sewer. This is a relatively calm soundtrack, as it�s not exactly an action-filmed piece (as one would expect). It�s a bit calmer in nature, but that doesn�t make it any less enjoyable to listen to. It�s a welcome break from Drake�s previous action filled piece. The final segment, �Deadshot� brings back Robert J. Kral to wrap up the sixth and final story for us. This is yet another slow starting soundtrack, with quiet instruments building up to a more powerful core, which gets fully exploited in track 24 (�Gordon / Batman / The Train�). There are some cues reminiscent of Kral�s work on Superman: Doomsday here, often heard at the top of the quieter pieces that end in an upbeat tone. Once the battle between Batman and Deadshot gets underway, the track picks up and keeps it going until the very end. Kral wraps up the segment with another quiet and moving piece, while the End Credits Suite blends together the various styles heard in the film. Overall this is a very �heroic� sounding score and one that fits the film explicitly well. However because a lot of the film and soundtrack are so quiet at times, it makes for a hard score to really want to sit down and listen to on a whim. While there are a few fantastic tracks to be heard, there often just isn�t enough to push you forward to make the effort to pop the soundtrack in. Even with this calmer nature, the soundtrack is still very much worth listening to and owning, especially if you�re a fan of the film. Like the six segments of Gotham Knight itself however, there will be those that love it to death and those that absolutely hate it. The soundtrack fits this same area perfectly, but there�s no doubt in my mind that the Batman: Gotham Knight soundtrack is one of the best Batman scores to come about, simply because of the diversity we get from the three different composers. Recommended. La-La Land Records has released Batman: Gotham Knight in a standard clear jewel case with art from the various DVD editions placed on the cover and rear of the packaging. 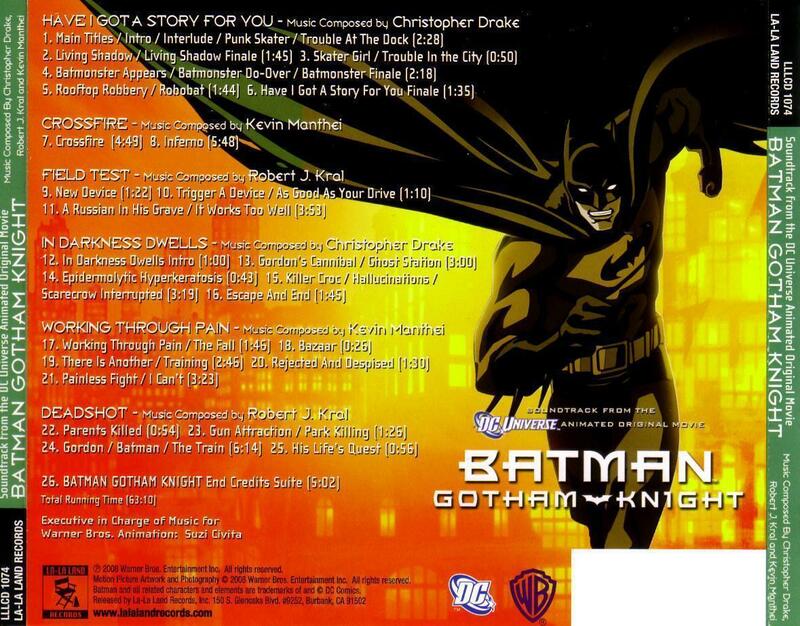 The booklet itself contains liner notes from the three composers, the first of which his Christopher Drake who tells a fantastic story about his meeting Kevin Conroy before he hit as a composer and how he got the job on the Gotham Knight DTV. Each one of the composers talk about each of their two segments, with Drake taking up a bit more time as he ending up scoring the �theme� to the whole Batman: Gotham Knight effort himself. Manthei and Kral talk mainly bout their segments of the film, as they had the previous Superman: Doomsday and The New Frontier soundtracks wholly to themselves. Each of the men point out their inspiration for their segments and what it took to get them to sound as they did; as usual this is a fantastic behind-the-scenes look into the making of the soundtracks and I applaud La-La Land Records for consistently providing not only some truly awesome soundtracks and getting them into the hands of fans but for also taking the time to get some comments from the composers to share their own thoughts on the soundtrack. Overall the Batman: Gotham Knight package comes Recommended. If you�re a fan, do not let this one pass you up.